Citation: Jini D, Joseph B. Salicylic Acid Mediated Salt Tolerance at Different Growth Stages of Oryza sativa l. and its Effect on Salicylic Acid Biosynthetic Pathway Genes. Biotechnol Ind J. 2017;13(2):134. Salicylic acid (SA) is one of the plant growth regulators which reduced the salt stress impact on plants. In the present investigation, the role of SA in inducing salinity tolerance was studied in different stages of Oryza sativa L. (ASD16 and BR26) and its role in the SA biosynthetic pathway genes for the salt tolerance. The salinity of five soil samples from Erayumanthurai region was analyzed and found that the soil sample E1 and E5 showed high and low salinity respectively. SA, when applied at 1.0 mM, provided considerable protection against salt stress imposed by adding 100 mM NaCl during the germination and vegetative stage. But the application of SA during the reproductive stage under salt stress condition did not improve the morphological characters and the yield. So, the SA was applied during the germination and vegetative stage to the low and high saline soil that increased the yield. The expression levels of SA biosynthetic pathway genes (OsCM, OsICS and OsPAL) were increased by the SA treatment under salt stress condition that may enhance the salt tolerance level of rice plants. So, the SA could be used as a potential growth regulator to improve plant growth under salt stress conditions. Rice (Oryza sativa L.) is the most important staple food crop that provides and meets the basic need to more than half of the world population [1,2] and is found to be highly sensitive to soil salinity. The ever-increasing demand of food in the world pushing agriculture to marginal lands such as salt affected soils, therefore increasing the need of finding ways to utilize these soils. This is feasible only by the improvement of soil properties and finding plants which could grow on these soils under stressful environment with minimum yield reduction. The exogenous application of phytohormones has gained a considerable ground as shotgun approach to ameliorate the adverse effects of salt stress on plants . Salicylic acid being an endogenous plant growth substance acted as a signal molecule modulating plant response  and signal transducer/messenger . Salicylic acid (SA) was synthesized in plants through two different pathways: the phenylpropanoid and the isochorismate pathways . Biosynthesis of SA was initially studied biochemically in tobacco leaves, leading to the discovery of the cytoplasmic phenylpropanoid pathway . It began with the conversion of phenylalanine to trans-cinnamic acid (t-CA), which was catalyzed by phenylalanine ammonia-lyase (PAL) . t-CA was then converted to benzoic acid (BA), and SA was derived from BA hydroxylation and catalyzed by benzoic acid 2-hydroxylase (BA2H) . Wildermuth et al. found a new SA synthesis pathway that run from chorismate via isochorismate in pathogen-infected Arabidopsis through the identification of two putative isochorismate synthase (ICS) genes . More studies in Arabidopsis indicated that SA could also be synthesized from chorismate to isochorismate [12,13]. Isochorismate was then converted to SA by isochorismate pyruvate lyase (IPL) . Catinot et al. also reported that the production of SA in response to biotic and abiotic stress depended on the isochorismate in Nicotiana benthamiana. SA could also be applied externally to regulate several physiological and biochemical functions [16,17]. SA had been found to play a key role in the regulation of plant growth, development, interaction with other organisms and in the responses to environmental stresses [18,19]. It is an important mediator of the plant resistance to pathogens and adverse environmental conditions such as drought stress, heavy metal stress and salt stress [19-21]. Many studies supported that SA induced the resistance of wheat , tomato , barley  and maize  to salinity and osmotic stress. The effect of exogenous SA on growth depended on the plant species, developmental stage and the SA concentrations tested. Even though there are many studies in the effect of SA for salt tolerance in plants, no study has proved the effect of SA in rice plants from germination stage to yield and its complete molecular mechanism. This study is the first attempt to prove the role of SA biosynthetic pathway genes for the salt tolerance in plants and the role of SA for salt tolerance from germination stage to reproductive stage of rice plant. ASD16 (salt sensitive variety) and BR26 (salt tolerant variety) are the two indica rice varieties used as the experimental plant in this research. Seeds of ASD16 were collected from Agricultural block, Munchirai and the BR26 seeds from Cox's Bazaar, Chittaggong, Bangladesh through Plant Morphogenesis lab, Department of Biological Sciences-National University of Singapore (DBS-NUS). The collected dried seeds were subsequently stored at 2°C and 40% relative humidity (RH) in the active collection storage vault of the gene bank until needed. Thereafter, seed samples were allowed to equilibrate at room temperature (25°C ± 1°C and 68% to 80% RH) for seven days before being subjected to germination test . Erayumanthurai (N 8°14'38.4" E 77°09'46.9") region of Kanyakumari District, Tamil Nadu, India was located between the Arabian Sea, AVM Canal and the perennial Thamirabarani River. The soil samples from five regions of Erayumanthurai (E1, E2, E3, E4 and E5) in 0.5 km distance were collected by adopting the soil sampling procedures of TNAU agritech portal (http://agritech.tnau.ac.in/agriculture/agri_soil_sampling.html). The salinity of the collected soil was analyzed by the determination of hydrogen ion concentration (pH), electrical conductivity (EC), exchangeable cations (Na+, K+, Ca2+, Mg2+) and chloride (Cl-) ions . The effect of salicylic acid on salt tolerance was analyzed in three different stages of rice such as germination stage, vegetative stage and reproductive stage. Seeds of ASD16 and BR26 (O. sativa L.) were surface sterilized in 20% bleach for 10 min and washed repeatedly in distilled water. Seeds were laid out in 9 cm petri dishes (10 seeds per dish). The salicylic acid (1.0 mM), sodium chloride (100 mM) and the combination of salicylic acid (1.0 mM) and NaCl (100 mM) were added as treatment (10 ml per petri dish). For the control, distilled water was used. Treatments were replicated three times and the plates were placed in a growth chamber at 25°C ± 2°C for germination. The germination rate was recorded at every day interval for seven days after which the seedlings were harvested and the shoot and root length were measured. The rate of germination was expressed in percentage. The SA (0 mM, 1.0 mM) pretreated seedlings (seven days old) were transferred into pots (13 cm in diameter and 14 cm height with small bottom outlet) that were filled with low saline soil (The physicochemical parameters of soil was analyzed and given in Table 1). Two germinated seeds were sown per pot and placed three pots on a floating tray with 3 cm level of water (The physicochemical parameters of water were analyzed and given in Table 2). Trays were randomly ranged on tables with three replicates. The experiments were carried out in wire net green house. After one week, abnormal seedlings (dead, too small or too big) were replaced and only one normal healthy seedling per pot was maintained. Treatment was applied during 30 to 58 days after sowing (vegetative stage of plant) with NaCl (100 mM), SA (1.0 mM) and the combination of NaCl with SA. The treatment solutions were renewed every week . The plant height and percent of injured leaves were calculated on 14 and 28 days after treatment. Table 1. Physico-chemical parameters of the selected soil samples. Table 2. Physico-chemical parameters of the water. The SA (0 mM, 1.0 mM) pretreated seedlings (seven days old) were maintained in floating trays with 3 cm level of water. The NaCl (100 mM) and SA (1.0 mM) were applied for two week at heading stage starting from 80 days after sowing. The morphological characters such as plant height, number of tillers and number of leaves and yield components such as number of panicles per plant, filled grains per panicles and weight of 1000 grains were measured after the treatment. The SA (1.0 mM) alone was applied to the low and high saline soil (Table 1) during the vegetative stage of rice plant to check the yield of the rice under salt stress condition. The proteomic and genomic analysis was done in the germination stage of rice to study the role of salicylic acid on salt tolerance in the molecular level. The RNA was extracted by Trizol-Reagent (Catalog Number 15596-018 from Life technologies) and the first strand cDNA was synthesized by using Maxima® First Strand cDNA Synthesis Kit (Fermentas, Catalog Number K1641). The qRT-PCR analyses were carried out using the AB power SYBR Green PCR Master mix kit (Applied Biosystems, P/N 4367659) according to the manufacturer’s protocol. The amplification of ACTIN gene (OsACT) was used as an internal control to normalize the data and the corresponding sequence of the forward primer was CCAAGGCCAATCGTGAGAAGA and the reverse primer AATCAGTGAGATCACGCCCAG (Amplicon size-227 bp). The threshold cycle (CT) value was automatically calculated based on the changes in fluorescence of SYBR Green dye in every cycle monitored by the ABI 7900 system software. The mRNA relative amount was estimated from the CT value according to Jiang et al. and was used to evaluate expression level of analyzed genes. All the primers (Table 3) used for qRT-PCR were designed using full length cDNA sequences by NCBI primer BLAST online software. Table 3. Primers Used for qRT-PCR Analysis. The statistical analysis was carried out using Prism software (GraphPad Prism Version-3.0, GraphPad Software Inc., San Diego California, USA). All the experimental data were derived from the biological and technical triplicates and the results were expressed as mean ± standard deviation. The paired sample ‘t’ test, Pearson correlation and Tukey’s multiple-range test were employed to assess the statistical significance of results. All the treatment was compared with the control to find the significance. In addition, NaCl treatment was compared with SA+ NaCl treatment to find the significant effect of SA on salt tolerance. P-Value less than 0.05 were considered as significant. The E1, E2, E3, E4, and E5 samples showed a significant (P<0.05) decreasing trend in all the parameters analysed. It was observed that the soil sample E1 had the highest salinity and E5 had the lowest salinity that was used as the experimental soil in this study (Table 4). Table 4. Soil salinity of the collected samples. The salicylic acid (SA) was acted more effectively on germination stage of rice plants for salt tolerance (Table 5). The NaCl treatment significantly (P<0.05) reduced the rate of germination in both the cultivars from 2nd day to 5th day of incubation. The 100% germination rate was attained on the 2nd day in control and SA treated plants of AS16. But in BR26 it was on 3rd day. The SA treatment significantly (P<0.05) increased the germination on the 2nd day in BR26 from 97% to 100%. The NaCl treated seeds reached its 100% germination rate on 7th day in ASD16 and 5th day in BR26. But the SA + NaCl treatment reached its 100% germination on 4th day in both the cultivars that was significantly higher than the NaCl treatment (Table 5). The NaCl + SA treatment significantly (P<0.05) increased the germination rate from the NaCl treatment as 50 to 90% in ASD16 and 66 to 90% in BR26 on 2nd day; 86 to 100% in ASD16 and 94% to 100% in BR26 on 4th day. The NaCl treatment significantly (P<0.05) reduced the root and shoot length on both the cultivars. 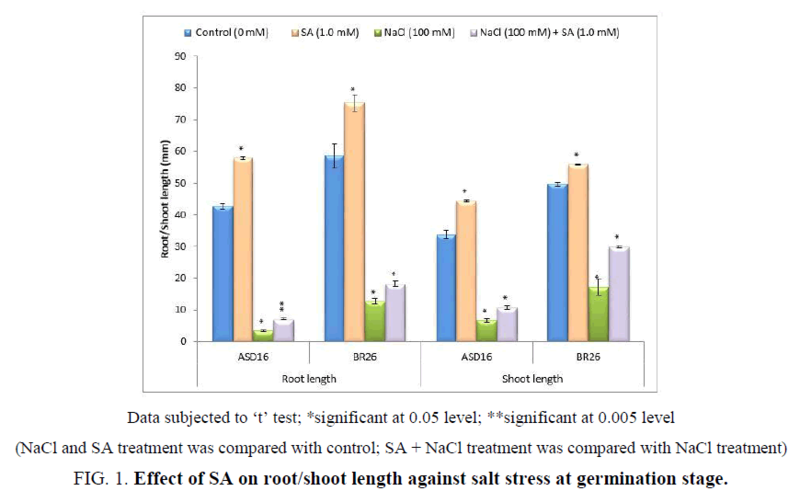 But the SA (1.0 mM) treatment under salt and non-salt stress condition significantly (P<0.05) increased the root and shoot length from the NaCl treatment and control (0 mM) in both the cultivars (Figure 1). The results proved that the SA incorporation to the salty (NaCl) medium significantly enhanced the germination and growth rate in both the cultivars. Table 5. Effect of salicylic acid on the germination rate (%) of ASD16 against salt stress. Figure 1: Effect of SA on root/shoot length against salt stress at germination stage. The SA application during the vegetative stage alleviated the salt stress impact on both the tested rice cultivars in terms of improved plant height and reduced injured leaves. The plant height was significantly (P<0.05) reduced by NaCl treatment that showed negative correlation with control. But the SA + NaCl treatment significantly (P<0.05) increased the plant height ( Figure 2) from the NaCl treatment from 14 to 28 days of the treatment in both the rice cultivars that was positively correlated. There was no significant correlation in the plant height between control and SA treated plants. 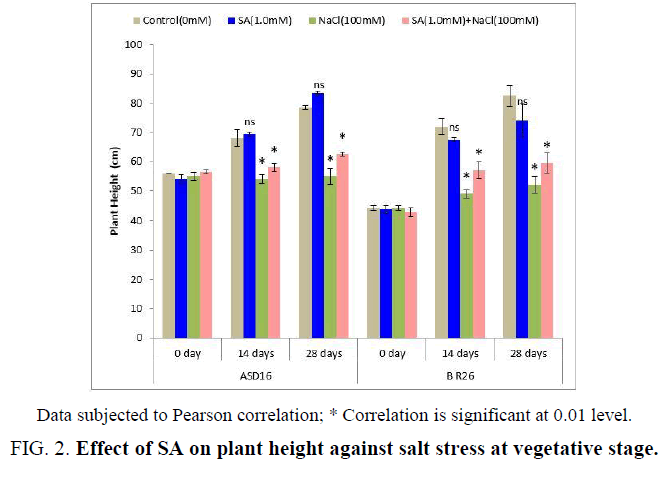 Figure 2: Effect of SA on plant height against salt stress at vegetative stage. Data subjected to Pearson correlation; * Correlation is significant at 0.01 level. Morphological salt tolerance was based on the evaluation of the ratio of injured leaves by discolored /rolled or dead leaves per plant. The percentage of injured leaves was significantly (P<0.05) increased by NaCl treatment that was significantly (P<0.05) reduced by SA treatment under salt stress condition. The application of SA did not made any significant changes in the non-salt stressed plants. But under the salt stress condition, the effect of SA is more significant for salt tolerance (Figure 3). 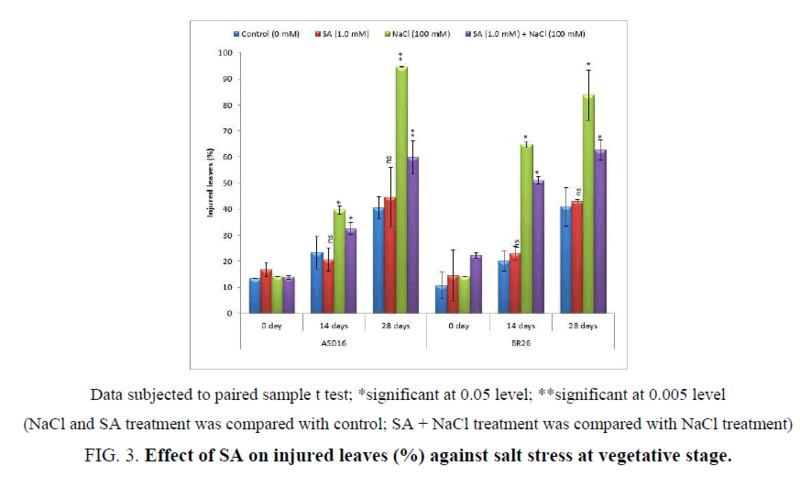 Figure 3: Effect of SA on injured leaves (%) against salt stress at vegetative stage. In the reproductive growth stage, panicle development takes place and nourishment of this stage is very important for the increase of yield. The result showed that the SA application during the reproductive stage significantly (P<0.05) increased all the morphological characters under non-salt stress condition. But under the salt stress condition, the SA (SA + NaCl) treatment did not cause any significant variation in the morphological characters except the plant height in BR26 that was increased from 92.33 cm to 94.33 cm (Table 6). Table 6. Effect of salicylic acid on morphological characters of ASD16 and BR26 against salt stress. The application of SA at the reproductive stage significantly (P<0.05) increased the yield and yield components of both the cultivars under non-salt stress condition except the number of filled grains per panicle and weight of 1000 grains in ASD16. The salt stress significantly (P<0.05) decreased the yield and yield components in both the cultivars and the application of SA was not significantly (P>0.05) improved the yield and yield components of both the cultivars under salt stress condition (Table 7). Table 7. Effect of salicylic acid on the yield and yield components of ASD16 and BR26 against salt stress. The SA application during the reproductive stage did not make any significant improvement in the plant growth and yield. So, SA was applied to the low and high saline soil during the germination and vegetative stage of rice and the yield was checked. The yield was significantly (P<0.05) lower in high saline soil than the low saline soil. The application of SA to the low and high saline soil significantly (P<0.05) improved the yield in both the cultivars (Figure 4). 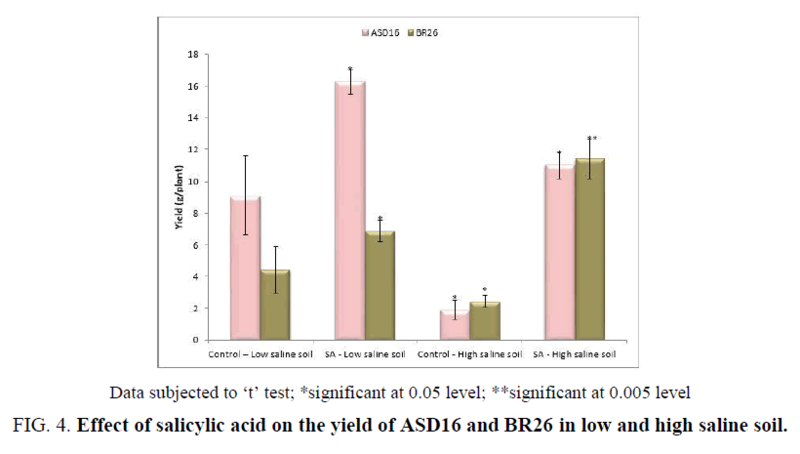 Figure 4: Effect of salicylic acid on the yield of ASD16 and BR26 in low and high saline soil. All the selected SA biosynthetic pathway genes were significantly (P<0.05) increased by the NaCl treatment in both the cultivars except OsCM in BR26. The SA + NaCl decreased the expression level of OsPAL from the NaCl treatment in both the cultivars. In ASD16, there was no significant variation between the NaCl and SA + NaCl treatment in the expression level of OsCM and OsICS. But in BR26, the decreased expression level of OsCM by the NaCl treatment was increased by SA + NaCl treatment and increased expression level of OsICS by the NaCl treatment was decreased by SA + NaCl treatment (Figure 5). Figure 4: Expression of salicylic acid biosynthetic pathway genes in ASD16 and BR26 shown by qRT-PCR analysis. Salinity was one of the most important abiotic stresses that limited the crop production in arid and semi-arid regions, where soil salt content was naturally high and precipitation could be insufficient for leaching . The saline soils were defined by USDA Salinity Laboratory as those had an electrical conductivity (EC) of 4 dSm-1 or more. EC was the electrical conductivity of the ‘saturated paste extract’. The most widely accepted definition of a saline soil had been adopted from FAO  as one that had an EC of 4 dS m-1 or more and soils with EC exceeding 15 dS m-1 were considered strongly saline. The soil sample E1 exhibited higher EC (0.84 dS m-1) and E5 showed lesser EC (0.10 dS m-1) when compared with other soil samples (Table 4). According to the US Salinity Laboratory Staff (1954), there were four levels of soil salinity based on electrical conductivity such as low salinity (EC of less than 0.25 dS m-1), medium salinity (0.25 dS m-1 to 0.75 dS m-1), high salinity (0.75 dS m-1 to 2.25 dS m-1) and very high salinity (EC exceeding 2.25 dS m-1). Based on the US Salinity Laboratory Staff (1954) , the soil sample E1 had higher salinity and E5 had low salinity (Table 4). The common cations associated with salinity were Na+, Ca2+, Mg2+ and K+, while the common anions were Cl? and HCO3? . The soil sample E1 had higher anion and exchangeable cations and E5 had lower anion and exchangeable cations than other soil samples (Table 4). Hasegawa et al. found that the Na+ and Cl? ions were the most important ions because both were toxic to plants and they also deteriorated the physical structure of soil. When NaCl was oxidized by water, it produced sodium (Na+) and chloride ions (Cl‾), which were easily absorbed by the root cells of higher plants and transferred to the whole plant using xylem uploading channels . Salicylic acid was a signaling molecule, naturally occurred in plants and played a major role in regulating plant growth and development . SA also had a role in germination under stressful conditions, although its definite role and the underlying molecular mechanisms involved have not been fully elucidated [37,38]. Our results showed that the decreased rate of germination by the salt stress was significantly increased by the application of SA (1.0 mM) in both ASD16 and BR26 (Table 5). In the same way, Torabian  reported that the salinity stress decreased germination percentage, seed vigor index and growth parameters that was improved by SA pre-treatment. Asadi et al. also showed that the SA pre-treatment increased the germination percentage under salt stress condition. The results also showed that the plant growth (shoot and root length) of rice cultivars was reduced by salinity that was significantly enhanced by the application of SA under salt stress conditions ( Figure 1). It indicated that salicylic acid application on rice plant exhibited an increase in salt tolerance. Similarly, SA treatment enhanced the growth of mungbean , violet  and maize  under NaCl stress. It had been suggested that the growth-promoting effects of SA could be related to changes in the hormonal status  or by improvement of photosynthesis, transpiration and stomatal conductance . The morphological characters such as plant height and injured leaves (%) were significantly affected by salt stress (100 mM) that was alleviated by the application of SA during the vegetative stage (Figure 2 and Figure 3). Similarly, Farahbakhsh and Saiid  proved that the foliar application of SA on vegetative stage increased the morphological characters such as stem length, number of leaves, leaf area and chlorophyll under saline condition. Wasti et al. also found out that the adverse effects of salt stress on tomato plants were alleviated by the exogenous application of SA at vegetative stage, which upregulated nutrition and the accumulation of some organic solutes and osmoprotectors such sugars, proline, and proteins. The stimulation effect of SA on plant growth was also confirmed by El-Shraiy and Hegazi  on pea plant. The improved plant growth and reduced injured leaves by SA under salt stress condition (Figure 2 and Figure 3) may be due to its physiological role such as absorption of ions flowering  and photosynthesis processes  which could directly or indirectly regulate the plant growth parameters. The application of SA under non-salt stress condition at reproductive stage significantly improved all the morphological characters and the yield components in both the cultivars (Tables 6 and 7). Similarly, Anosheh et al. proved that the application of SA on reproductive stage increased the plant growth and chlorophyll content in wheat. The enhancement in growth by SA (Table 6) may be due to the increased stimulation of physiological and biochemical processes, which ultimately resulted in higher yield production (Table 7). But the SA application during the reproductive stage under salt stress condition did not significantly affect the morphological characters and the yield components (Tables 6 and 7). This insignificant effect of SA during the reproductive stage may be due to the NaCl-induced damage to the plants was again increased by SA, which was correlated with a reduction in yield. Similar to our results, Salehi et al. observed that the application of SA did not affect the shoot fresh and dry weights and number of flowers per plant with increasing salinity. Furthermore, Sharafizad also found that the application of SA on reproductive stage did not improve the yield and yield components of wheat under drought stress. In contrast, Pacheco et al. exhibited that the exogenous application of SA to marigold plants at the reproductive stage resulted in higher biomass production. From the farmer’s point of view the grain yield was the most important determinant in raising the crop productivity under salt stress condition. Our result showed that the SA application during the germination and vegetative stage to the low and high saline soil significantly increased the yield in both the cultivars (Figure 4). Higher rate of germination and plant growth rate (Figure 1 and Figure 2) might also contribute to the increased grain yield. The SA-induced yield enhancement might be due to the certain physiological role of SA such as absorption of ions, flowering [48,53] and photosynthesis processes [49,54] which could directly or indirectly regulate the yield. Thus, from the results, it could be concluded that the use of SA as a recognized endogenous signal molecule, which was mainly discussed in plant resistance against salinity stress, could be responsible for alleviating salinity stress and improved the plant growth and yield. SA biosynthesis is happening in plants through phenylpropanoid pathway and isochorismate pathway. In the phenylpropanoid pathway, chorismate mutase catalyzed the conversion of chorismate to prephenate for the production of phenylalanine . Trans-cinnamic acid was formed from phenylalanine through the catalytic action of phenylalanine ammonia-lyase . The trans-cinnamic acid was converted to benzoic acid and then to SA catalyzed by benzoic acid 2-hydroxylase . The isochorismate pathway, involves the conversion of chorismate to isochorismate, catalyzed by isochorismate synthase  which is then converted to SA by isochorismate pyruvate lyase . We have selected three genes (OsCM, OsICS and OsPAL) involved in the two SA biosynthesis pathways for the expression studies, to check the role of exogenous SA on these genes for the salt tolerance. The expression of a bacterial bi-functional chorismate mutase gene (Phe A) in Arabidopsis thaliana showed a large increase in the level of Phenyl alanine . The study revealed that the expression of OsCM was decreased by the salt stress and was increased by the application of SA under salt stress condition in BR26. In contrast, the expression in ASD16 was increased by the salt stress and was not changed by the application of SA under salt stress condition (Figure 5). Hu et al. found that the chorismate mutase (HvCM1) contributed to the penetration resistance against powdery mildew in barley. Ogawa et al. exhibited that the transcript levels of the chorismate mutase (CM) genes in wild-type tobacco were increased by the ozone stress. Wildermuth et al. showed that the SA was synthesized from chorismate via isochorismate by the catalytic activity of ICS in pathogen-infected Arabidopsis. It had been found that ICS was the rate-limiting enzyme for SA synthesis in Pseudomonas aeruginosa . The expression level of OsICS was increased by the salt stress in both the cultivars that was decreased by the application of SA under salt stress condition in BR26 and was not changed in ASD16 (Figure 5). Yu et al. proved that the exposure of probenazole (a highly effective chemical inducer of systemic-acquired resistance) significantly increased ICS activity. Ogawa et al. exhibited that the exposure of Arabidopsis to ozone enhanced the accumulation of SA by the increased activity of ICS. There were many studies suggested that plants synthesized SA from phenylalanine [7,62]. Application of 2-amino-indan-2-phosphonic-acid, which was an inhibitor of PAL, inhibited SA accumulation in pathogen-infected Arabidopsis and elicitor-treated potato . Our result showed that the expression level of OsPAL was increased by the salt stress and was decreased by the application of SA under salt stress condition in both the rice cultivars (Figure 5). In contrast to the result, Dunn et al. displayed that the activity of PAL enzyme was decreased by the salt stress in citrus plant. Radi et al. also exhibited that the NaCl stress did not affect the phenylalanine ammonia-lyase activity in leaves of the selected wheat and bean cultivars, except in salt-tolerant bean cultivar (cv. Sakha1). But there were some findings suggested that under unfavorable conditions, SA was synthesized in plant tissue by the accumulation of PAL [65-67]. Our result showed that the expression level of all the selected genes (OsCM, OsICS and OsPAL) involved in SA biosynthetic pathway was increased by the NaCl treatment in ASD16 and the addition of SA did not significantly change the expression level except OsPAL (Figure 5). The lower expression level of OsPAL by SA + NaCsl treatment than the NaCl treatment (Figure 5) may be due to the alleviative effect of SA. Even though, the SA application reduced and alleviated the stress condition in ASD16, the expressions of OsCM and OsICS were very much needed for the stress tolerance. So, the SA + NaCl treatment did not change the expression level of OsCM and OsICS in ASD16. These results proved that these genes were involved in the stress tolerance in addition to the SA synthesis [58,66,68] and the SA may be synthesized through both the phenylpropanoid and the isochorismate pathways in this cultivar. But the results in BR26 denoted that the SA synthesis under the salt stress condition may happen only through the isochorismate pathway because the expression level of OsICS and OsPAL were increased and OsCM was decreased by the salt stress (Figure 5). But the combination of salt and salicylic acid lead to the synthesis of SA through the two pathways that was proved from the result that all the genes were significantly expressed by the SA + NaCl treatment from the control (Figure 5). The study proved that the salicylic acid application during the germination and vegetative stage caused an increase in the growth and yield of ASD16 and BR26 rice cultivars under salt stress conditions. So, the farmers can cultivate the rice in the salty regions by applying the SA during the germination and vegetative stage. But more field trials are required to find the appropriate mode of application (spraying or watering) and the concentration for different varieties of rice. The SA treatment under salt stress condition triggered all the selected genes in salicylic acid biosynthetic pathway. More studies with transcriptomics in all the different stages will tell more SA-triggered genes that can be used for the production of salt tolerant varieties of rice. Baby Joseph designed the experiment and guided to execute. D. Jini conducted the experiment, analyzed the data, and wrote the manuscript. Baby Joseph and D. Jini were critically revised the manuscript. All authors read and approved the final manuscript. With deep sense of honor, I am so grateful to Prof. Dr. Prakash P. Kumar for allowing me to do the molecular studies in the Plant Morphogenesis lab of Department of Biological Science-National University of Singapore (DBS-NUS). I would like to express my sincerest gratitude to Rev. Fr. Prem Kumar (Secretary and Correspondent of Mar-Ephrem Engineering College, Elavuvilai) for his encouragement and motivating words to my research. I am also thankful to Mr. K. Suresh (Department of microbiology, Malankara Catholic college, Mariagiri) and Dr. S. Sujatha (International Centre for Bioresource Management) and for their suggestive directions during this research work. Khush GS. What it will take to feed 5.0 billion rice consumers in 2030. Plant Mol Biol. 2005;59:1-6. Ma H, Chong K, Deng XW. Rice research: past, present and future. J Integr Plant Biol. 2007;49:729-30. Javid MG, Sorooshzadeh A, Moradi F, et al. The role of phytohormones in alleviating salt stress in crop plants. Australian J Crop sci. 2011;5:726-34. Singh B, Usha K. Salicylic acid induced physiological and biochemical changes in wheat seedlings under water stress. Plant Growth Regul. 2003;39:137-41. Senaratna T, Touchell D, Bunn E, et al. Acetyl salicylic acid (Aspirin) and salicylic Acidinduce multiple stress tolerance in bean and tomato plants. Plant Growth Regul. 2000;30:157-61. Dempsey DA, Vlot AC, Wildermuth MC, et al. Salicylic acid biosynthesis and metabolism. Arabidopsis Book. 2011;9:e0156. Coquoz J, Buchala A, Metraux JP. The biosynthesis of salicylic acid in potato plants. Plant Physiol. 1998;117:1095-101. Rohde A, Morreel K, Ralph J, et al. Molecular phenotyping of the pal1 and pal2 mutants of Arabidopsis thaliana reveals far-reaching consequences on phenylpropanoid, amino acid, and carbohydrate metabolism. Plant Cell. 2004;16:2749-71. Leon J, Shulaev V, Yalpani N, et al. Benzoic acid 2-hydroxylase, a soluble oxygenase from tobacco, catalyzes salicylic acid biosynthesis. Proc Natl Acad Sci USA. 1995;92:10413-7. Wildermuth MC, Dewdney J, Wu G, et al. Isochorismate synthase is required to synthesize salicylic acid for plant defence. Nature. 2001;414:562-5.
vanTegelen LJP, Moreno PRH, Croes AF, et al. Purification and cDNA cloning of isochorismate synthase from elicited cell cultures of Catharanthus roseus. Plant Physiol. 1999;119:705-12. Shah J. The salicylic acid loop in plant defense. Curr Opin Plant Biol. 2003;6:365-71. Durrant WE, Dong X. Systemic acquired resistance. Annu Rev Phytopathol. 2004;42:185-209. Chen Z, Zheng Z, Huang J, et al. Biosynthesis of salicylic acid in plants. Plant Signal Behav. 2009;4:493-6. Catinot J, Buchala A, Abou ME, et al. Salicylic acid production in response to biotic and abiotic stress depends on isochorismate in Nicotiana benthamiana. FEBS Letters. 2008;582:473-8. Canakci S. Effects of salicylic acid on growth, biochemical constituents in pepper (Capsicum annuum L.) seedlings pak J Biol Sci. 2011;14:300-4. Habibi G. Exogenous salicylic acid alleviates oxidative damage of barley plants under drought stress. Acta Biologica Szegediensis. 2012;56:57-63. Moradkhani S, Nejad RAK, Dilmaghani K, et al. Salicylic acid decreases Cd toxicity in sunflower plants. Ann Biol Res. 2013;4:135-41. Mura K, Tada Y. Regulation of water, salinity and cold stress responses by salicylic acid. Front Plant Sci. 2014. Joseph B, Jini D. Insight into the role of antioxidant enzymes for salt tolerance in plants. Int J Bot. 2010;6:456-64. Pooja V, Ram A, Gadi BR. Effect of salicylic acid on photosynthetic pigments and some biochemical content in vigna seedlings under cadmium stress. J Chem Biol Phy Sci. 2012;2:1801-9. Turkyilmaz B. Effects of salicylic and gibberellic acids on wheat (Triticum aestivum L.) under salinity stress. Bangladesh J Bot. 2012;41:29-34. Agamy RA, Hafez EE, Taha TH. Acquired resistant motivated by salicylic acid applications on salt stressed tomato (Lycopersicon esculentum Mill). American-Eurasian J Agric Environ Sci. 2013;13:50-7. Fayez KA, Bazaid SA. Improving drought and salinity tolerance in barley by application of salicylic acid and potassium nitrate. J Saudi Society Agri Sci. 2014;13:45-55. Bagheri MZ. The effect of maize priming on germination characteristics, catalase and peroxidase enzyme activity, and total protein content under salt stress. Int J Biosci. 2014;4:104-12. Waheed A, Ahmad H, Abbasi FM. Different treatment of rice seed dormancy breaking, germination of both wild species and cultivated varieties (Oryza sativa L.). J Mater Environ Sci. 2012;3:551-60. VanReeuwijik LP. Procedures for soil analysis. 6th edition. In: Wageningen, International Soil Reference and Information Centre. 2002. Xu XY, Mcgrath SP, Meharg AA, et al. Growing rice aerobically markedly decreases arsenic accumulation. Environ Sci Technol. 2008;42:5574-9. Jiang SY, Bachmann D, La H, et al. Ds insertion mutagenesis as an efficient tool to produce diverse variations for rice breeding. Plant Mol Biol. 2007;65:385-402. Zhao J, Ren W, Zhi D, et al. Arabidopsis DREB1A/CBF3 bestowed transgenic tall rescue increased tolerance to drought stress. Plant Cell Rep. 2007;26:1521-8. FAO. Fact sheets: World Food Summit-November 1996. Rome, Italy. US Salinity Laboratory Staff. Reclamation and improvement of saline and sodic soils. USDA Handbook 60. Riverside, California, 1954. Hasegawa PM, Bressan RA, Zhu J, et al. Plant cellular and molecular responses to high salinity. Annu Rev Plant Physiol Plant Mol Biol. 2000;51:463-99. Rodriguez NA, Rubio F. High-affinity potassium and sodium transport systems in plants. J Exp Bot. 2006;57:1149-60. Huang RH, Liu JH, Lu YM, et al. Effect of salicylic acid on the antioxidant system in the pulp of ‘Cara cara’ navel orange (Citrus sinensis (L.) Osbeck) at different storage temperatures. Postharvest Biol Technol. 2008;47:168-75. Alonso RA, Rodriguez D, Reyes D, et al. Evidence for a role of gibberellins in salicylic acid-modulated early plant responses to abiotic stress in Arabidopsis seeds. Plant Physiol. 2009;150:1335-44. Asadi M, Heidari MA, Kazemi M, et al. Salicylic acid induced changes in some physiological parameters in chickpea (Cicer arietinum L.) under salt stress. J Agri Technol. 2013;9:311-6. Khan NA, Sayeed S, Masood A, et al. Application of salicylic acid increases contents of nutrients and antioxidative metabolism in mungbean and alleviates adverse effects of salinity stress. Int J Plant Biol. 2010;1:1-8. Torabian AR. Effect of salicylic acid on germination and growth of alfalfa (Medicago sativa L.) seedlings under water potential loss at salinity stress. Plant Ecophysiol. 2010;2:151-5. Hussain K, Nawaz K, Majeed A, et al. Role of exogenous salicylic acid applications for salt tolerance in violet. Sarhad J Agric. 2011;27:171-5. Tufail A, Arfan M, Gurmani AR, et al. Salicylic acid induced salinity tolerance in maize (Zea mays). Pak J Bot. 2013;45:75-82. Abreu ME, Munne BS. Salicylic acid deficiency in NahG transgenic lines and sid2 mutants increases seed yield in the annual plant Arabidopsis thaliana. J Exp Bot. 2009;60:1261-71. Stevens J, Senaratna T, Sivasithamparam K. Salicylic acid induces salinity tolerance in tomato (Lycopersicon esculentum cv. Roma): Associated changes in gas exchange, water relations and membrane stabilization. Plant Growth Regul. 2006;49:77-83. Farahbakhsh H, Saiid MS. Effects of foliar application of salicylic acid on vegetative growth of maize under saline conditions. Afr J Plant Sci. 2011;5:575-8. Wasti S, Mimouni H, Smiti S, et al. Enhanced salt tolerance of tomatoes by exogenous salicylic acid applied through rooting medium. J Integrat Biol. 2012;16:200-7. El-Shraiy AM, Hegazi AM. Effect of acetylsalicylic acid, indole-3-bytric acid and gibberellic acid on plant growth and yield of pea (Pisum sativum L.). Aust J Basic Applied Sci. 2009;3:3514-23. Wada KC, Takeno K. Stress-induced flowering. Plant Sig Behav. 2010;5:944-7. Fariduddin Q, Hayat S, Ahmad A. Salicylic acid influences net photosynthetic rate, carboxylation efficiency, nitrate reductase activity, and seed yield in Brassica juncea. Photosynthetica. 2003;41:281-4. Anosheh HP, Emam Y, Ashraf M, et al. Exogenous application of salicylic acid and chlormequat chloride alleviates negative effects of drought stress in wheat. Adv Studies Biol. 2012;4:501-20. Salehi S, Khajehzadeh A, Khorsandi F. Growth of tomato as affected by foliar application of salicylic acid and salinity. American-Eurasian J Agric Environ Sci. 2011;11:564-7. Pacheco AC, Cabral CD, Fermino ESD, et al. Salicylic acid-induced changes to growth, flowering and flavonoids production in marigold plants. J Med Plants Res. 2013;7:3158-3163. Wada KC, Yamada M, Shiraya T, et al. Salicylic acid and the flowering gene flowering locus T homolog are involved in poor-nutrition stress-induced flowering of Pharbitis nil. J Plant Physiol. 2010 167:447-452. Uzunova AN, Popova LP. Effect of salicylic acid on leaf anatomy and chloroplast ultrastructure of barley plants. Photosynthetica. 2000;38:243-50. Mobley EM, Kunkel BN, Keith B. Identification, characterization and comparative analysis of a novel chorismate mutase gene in Arabidopsis thaliana gene. 1999;240:115-23. Tzin V, Malitsky S, Aharoni A, et al. Expression of a bacterial bi-functional chorismate mutase/prephenate dehydratase modulates primary and secondary metabolism associated with aromatic amino acids in Arabidopsis. Plant J. 2009;60:156-67. Hu P, Meng Y, Wise RP. Functional contribution of chorismate synthase, anthranilate synthase, and chorismate mutase to penetration resistance in barley-powdery mildew interactions. Mol Plant Microbe Interact. 2009;22:311-20. Ogawa D, Nakajima N, Sano T, et al. Salicylic acid accumulation under O3 exposure is regulated by ethylene in tobacco plants. Plant Cell Physiol. 2005;46:1062-72. Gaille C, Reimmann C, Haas D. Isochorismate synthase (PchA), the first and rate-limiting enzyme in salicylate biosynthesis of Pseudomonas aeruginosa. J Biol Chem. 2003;278:16893-8. Yu J, Gao J, Wang XY, et al. The pathway and regulation of salicylic acid biosynthesis in probenazole-treated Arabidopsis. J Plant Biol. 2010;53:417-24. Ogawa D, Nakajima N, Tamaoki M, et al. The isochorismate pathway is negatively regulated by salicylic acid signaling in O3-exposed Arabidopsis. Planta. 2007;226:1277-85. Mauch-Mani B, Slusarenko AJ. Production of salicylic acid precursors is a major function of phenylalanine ammonia-lyase in the resistance of Arabidopsis to Peronospora parasitica. Plant Cell. 1996;8:203-12. Dunn DC, Duncan LW, Romeo JT. Changes in arginine, PAL activity and nematode behavior in salinity-stresses citrus. Phytochemistry.1998;49:413-7. Radi AA, Farghaly FA, Hamada AM. Physiological and biochemical responses of salt-tolerant and salt-sensitive wheat and bean cultivars to salinity. J Biol Earth Sci. 2013;3:B72-88. Martinez TMA, Lafuente MT. Effect of high temperature conditioning on ethylene, phenylalanine ammonialyase, peroxidase and polyphenol oxidase activities in flavelod of chilled “Fortune” mandarin fruit. J Plant Physiol. 1997;150:674-8. Ding CK, Wang CY, Gross KC. Jasmonate and salicylate induce expression of pathogenesis-related protein genes and increase resistance to chilling injury in tomato fruit. Planta. 2002;214:895-901. Navarro L, Bari R, Achard P. et al. DELLAs control plant immune responses by modulating the balance of jasmonic acid and salicylic acid signaling. Curr Biol. 2008;18:650-5. Harrower J, Wildermuth MC. Exogenous salicylic acid treatment of Arabidopsis thaliana Col-0. NCBI Gene Expression Omnibus Acession No. GSE33402. (2011).